Recently my oldest son graduated from High School with all the accompanying graduation parties and preparations that goes along with it. Now, for anyone who has gone through this, you may recall how involved all the activities were. 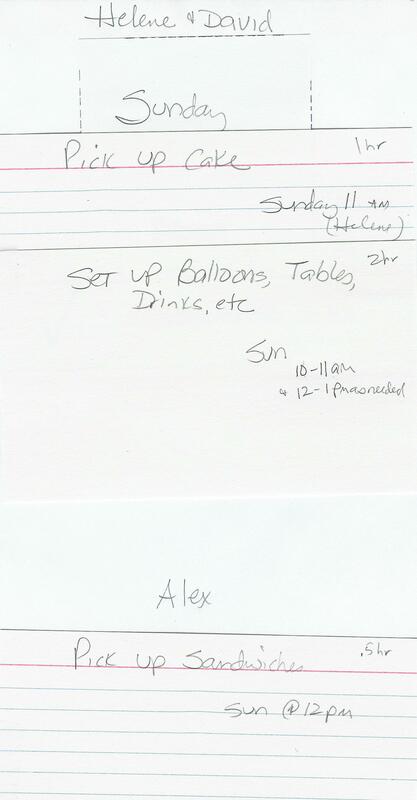 Add to this running a business and trying to keep your own sanity, and you may find like I did, that I needed a system for planning the event. I had basically two key projects to interleave, the graduation party preparations and the tasks of running my business. 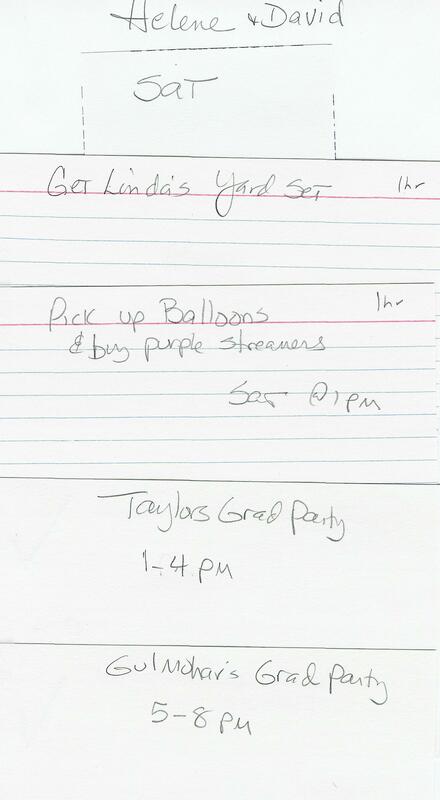 I started with creating a list of all the things I needed to do for the graduation party – see the below picture. As you’ll see, I made some attempt to assign dates to items to pace out the effort, and even began estimating how long it would take to do a particular task. The task list became unwieldy as soon as I wrote it. Immediately I wanted to move things around and see how well I could actually accomplish all this in the time allotted. The second project of running my business would certainly impact my ability to get everything done for the graduation party. I now needed to task out the business project, and merge the two. As you may know, I believe in keeping things simple and open to change using Agile-based tools. 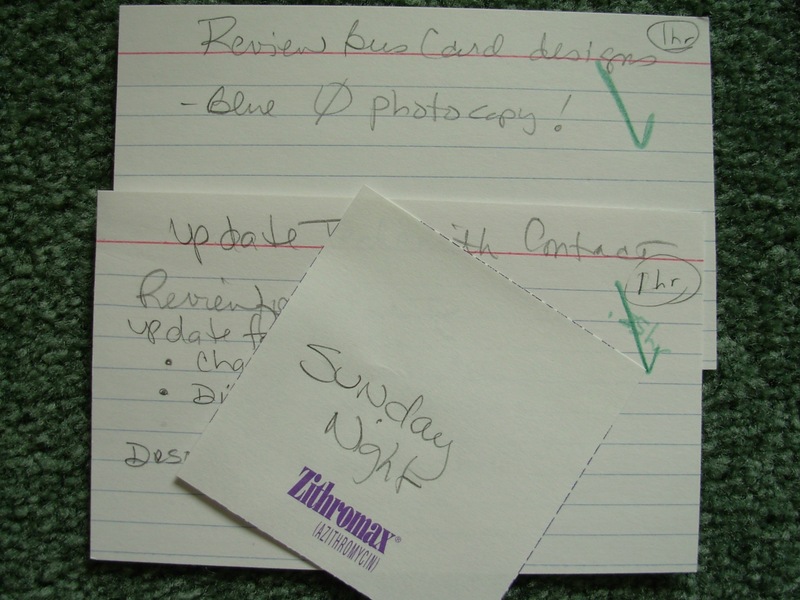 For the business efforts, I wrote down the item on a 3×5 card and estimated the effort it would take to complete it. 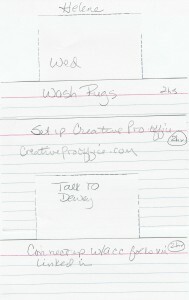 I then laid these out on a day-by-day basis – creating my work plan for the business, as shown below. 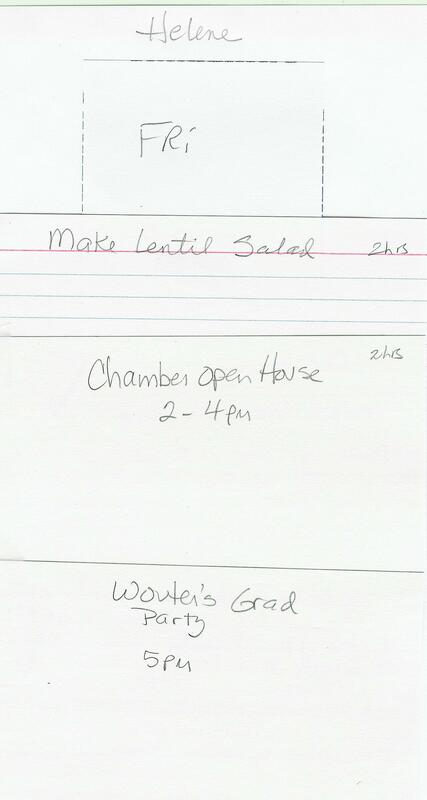 Likewise, I began transcribing all the tasks from the grad party list onto either 3×5 cards or sticky notes, estimated them, and began interleaving them with the business layout such that each day was evenly loaded with effort. 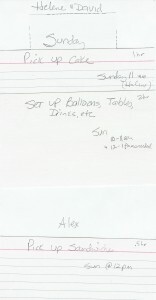 These were placed on 8×10 sheets of paper, where each sheet of paper represented a day, or one iteration. 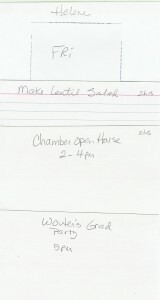 I now had a work plan for both projects. 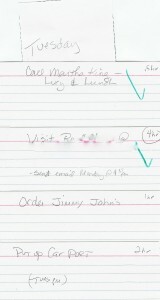 At the end of every day I would evaluate what got completed, as indicated by a green check mark, and what needed to move. Because as we all know, not everything goes as planned! Life happens, business needs change. Each day I got to re-evaluate what was key and what wasn’t. The daily review allowed me to re-prioritize the efforts to ensure that the key items would get completed, allowing less critical items to move to the bottom of the list. 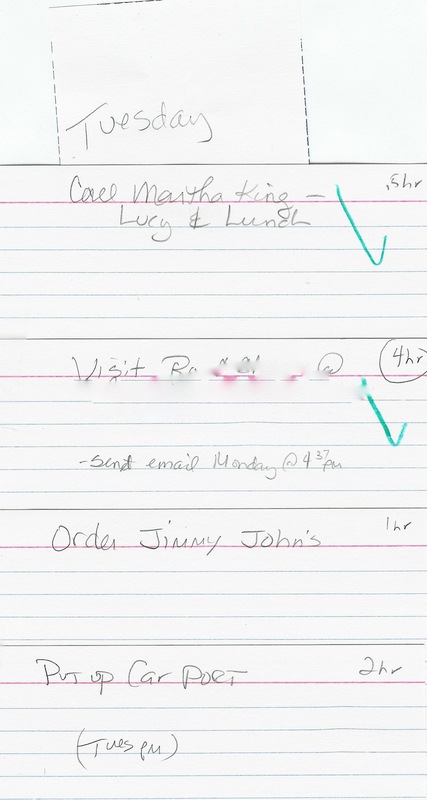 Additionally, I found that some items, like Thursday’s ‘Purchase last minute items’ was complete enough to take to the grocery store and use as a shopping list. 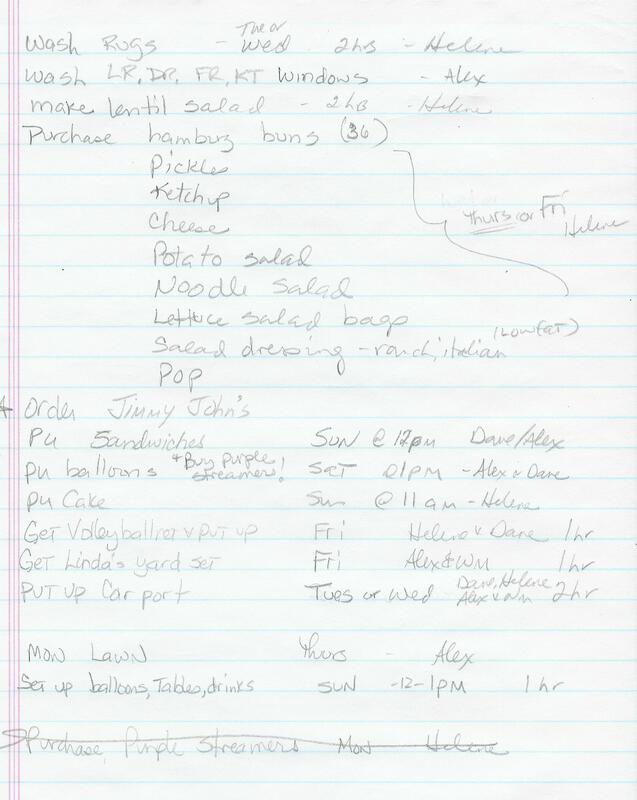 The tasks were more than just reminders, they were actionable items. 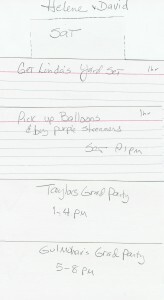 I started to share with my family the tasks needed to be completed for the party by referring to these plans, and leaving them in a common space. The plan became visible. Then a magical thing started to happen. My family not only started asking ‘what is on the plan that we need to do today?’, but they started looking at the plan themselves. They had begun to buy into the system, and take as much ownership as me on the efforts for the party. Sure, I could have just given them a task list, but I would much rather they buy into the effort on their own. Isn’t this what we want of our work teams? To be so engaged with the effort that they volunteer to work on items, and look for the next thing to do? Yes, the party went off without a hitch. 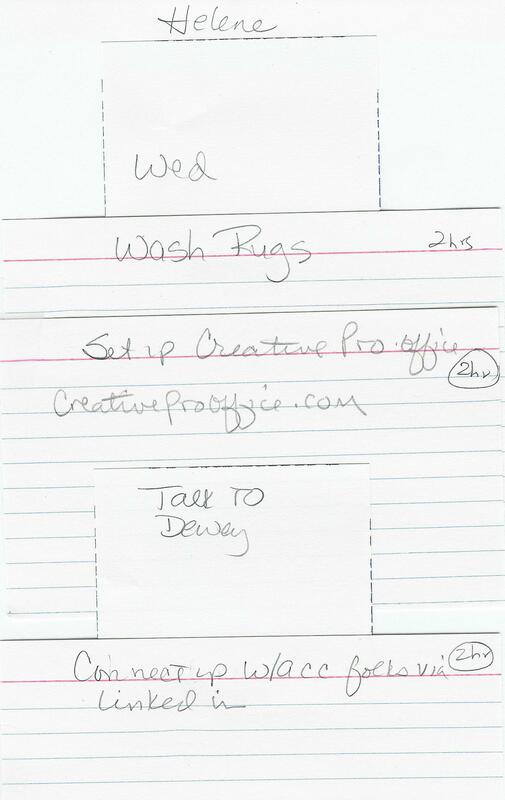 I even had enough time during the week to throw in some unplanned items, like handling last-minute business needs. Sunday came and I was not stressed out, everything that needed to be done was done without the usual last minute running-around and rushed feeling. Wouldn’t it be nice to have this happen for all our projects? It can. Try these simple Agile project management techniques for your next project, and see the difference yourself.